A decorated mortarboard from the spring 2013 commencement. TAMPA, Fla. -- Another semester is coming to a close, so that can mean only one thing: Commencement is almost here! Once again, the University of South Florida College of Arts and Sciences is sponsoring a fun contest for all of the USF Bulls graduating in December. We want to see your creativity and school pride displayed on your graduation cap. Photos must be uploaded to Instagram or posted to Twitter by 11:59 p.m. on Dec. 15, 2013, to be eligible for the contest. The grand prize winner will receive a “Keep Calm and Go Bulls” T-shirt. A “Keep Calm and Go Bulls” poster will be awarded to the following category winners: Funniest Grad Cap, Most Heartwarming Grad Cap, Best Use of Glitter Grad Cap and Rafters’ Favorite Grad Cap. How to participate: Graduates must follow us @USFCollege on Instagram or follow us on Twitter @USFCollege. For Instagram users, upload a picture of your decorated cap and tag the college @USFCollege and use the hash tag #USFGrad. 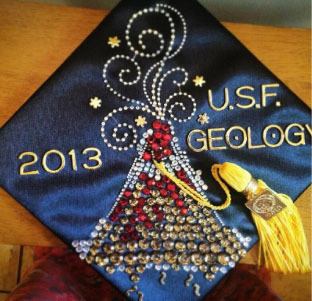 For Twitter users, tweet us your cap photo to @USFCollege and use the hash tag #USFGrad. The winners with the best hat décor will be announced on Dec. 17, and they have seven days to claim their prize. The Instagram app is available to download for free for iPhone and Android users.